The effect that nicotine and other drugs have on the body and the brain. 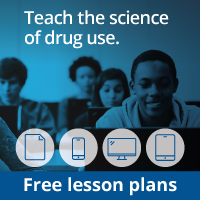 By teaching young children about how drugs affect the body, we can lay a foundation for students to make better decisions about their own health in the future. A suggestion for your child to share some thoughts through words or pictures. We hope that you and your child enjoy working on the program together and that the knowledge gained now will serve your family well in the future. Figuring out what the results mean. Students used these four steps to figure out what a mystery goo was made of. This activity aligns with the National Science Education Standards (NSES), guidelines developed in 1996 by the National Academy of Sciences to help schools know what science information should be covered in kindergarten through high school. The standards stress the importance of using scientific inquiry as a tool for approaching and solving problems. Throughout the NIDA Junior Scientists Program, we will let you know how each activity fits in with the NSES recommendations. Ask your child what he or she learned about scientific inquiry. Then try a science experiment with your child. Mix 1/3 cup of cornstarch and 1/3 cup of baking soda . What happens when you add water? Try it again, but add vinegar instead. What do your results tell you about the differences between water and vinegar? What do they tell you about the properties of the liquids? Try to use the steps of scientific inquiry to answer these questions. Have your child write or draw a picture about something related to scientific inquiry. You and your child may want to try some of the science experiments included in some of these resources. Science Series: Kitchen Chemistry. Monterey, CA: Evan Moor Educational Publishers, 1996. Includes activities and experiments that help students learn about the basic principles of chemistry with materials found in the kitchen. VanCleave, J.P. Chemistry for Every Kid: 101 Easy Experiments That Really Work. New York: John Wiley and Sons, Inc., 1991. A collection of more than 100 chemistry experiments showing how chemistry is part of our lives. Wiese, J. Head to Toe Science. New York: John Wiley & Sons, Inc., 2000. Includes over 40 activities and experiments that teach kids about the human body. Links to science-based activities and lessons. Lists of both simple and more complex experiments.